It seems in the last few weeks I have seen a number of patients that have consulted with me after they have been treated “Amniotic Stem Cells” but still continued to be symptomatic. Occasionally, I will also see a patient who claims that they were treated by “Cord Stem Cells”. The real question to ask was if these patients were actually treated with stem cells? I feel that I can say with good conviction that they were not! For those of us that have been involved in Regenerative Medicine for a while this is something that rubs us the wrong way. Regenerative Medicine is a newly emerging field where there are many different opinions and sometimes heated discussions and disagreements among the various professionals as to a variety of aspects of the science. However, the opinion on Amniotic stem cells has almost unanimous support by those professionals who are involved in this field. We all feel that there is no such thing as live amniotic or cord stem cells in these products. These products at best have growth factors which may give patients some temporarily relief of pain. Let us look at the nuts and bolts of the matter. The cord and amniotic products are registered as a 361 product with the FDA. This is a very simple product registration. It is a registration that involves tissues. It does not involve live cells! When a product has live cells, it is designated as a 351 by the FDA. There is a world of difference between a 351 and a 361. Many times, I have been approached by the sales persons telling me that these products contain live cells but they cannot say this publicly. Their pitch is “hey doc do not tell anyone but there are 10 million stem cells here”. Well, if indeed what they say is true than they just crossed the line and have become a 351 with the FDA. This is a very significant departure from a 361. The claim of live cells has crossed the line. The FDA regulation 21 CFR 1271.1 at section 4 part 2 states that if you claim that your cells are alive and have metabolic activity and they’re a donor tissue, that’s considered a drug. Once the FDA considers something a drug it will require what is called an IND. IND stands for “Investigational New Drug”. A 351 designation with an IND is a very lengthy process which requires many years, usually millions of dollars and lengthy clinical trials. As one can see it is not an easy task. Furthermore, if the physician is aware that these products contain live cells than he is also breaking the law. I decided to take the bull by the horns and actually call the FDA and get an opinion from them on these products. I called the following number (240) 402-8055. 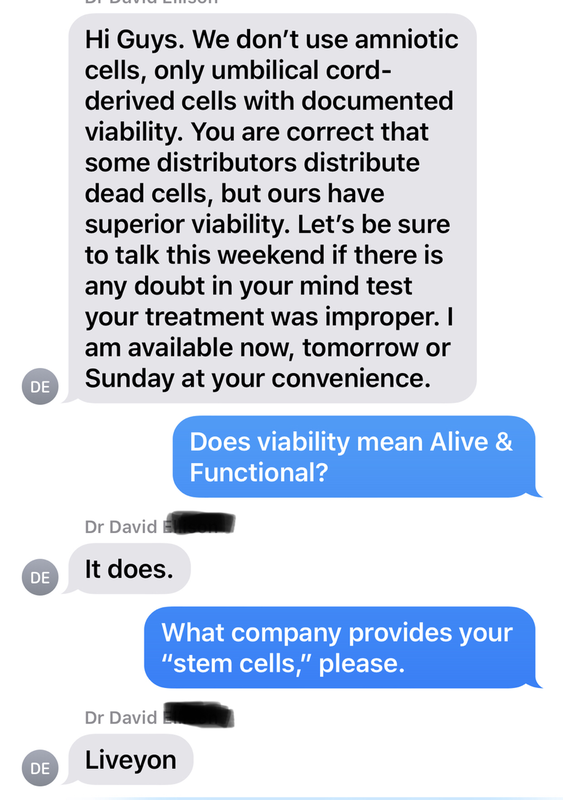 Within less than two minutes I was able to talk with an FDA specialist and I ask them if an amniotic product that had live cells was a 361. classification. I was told that it was not. It would be a 351 and requires an IND application. There is no grey area here. They had other concerns about these products but that will be the topic of another blog. I suspect it is only a matter of time before these products are significantly restricted. Now if a physician is using these products as a “stem cell procedure” to treat patients there arise some serious problems. He is either telling the patient a lie and deceiving them and committing fraud; or he is using a product that has no FDA approval as a drug. Furthermore, there is some question as to the indications of these products. This potentially exposes the physician to serious legal ramifications. In any case not a good situation. It can lead to problems on a variety of levels. Unfortunately, it also gives the entire field of Regenerative Medicine a black eye. I strongly advise all patients who have a physician telling them that they will use these products as a stem cell procedure to do the following. Call the number (240-402-8055) I have listed and ask the FDA about the status of these products. When they get the correct answer, they need to educate their uninformed doctor. They need to let the doctor know that they are being treated only with growth factors not stem cells. The prices that the patients are being charged for these products are outrageous. Remember, these products are essentially growth factors similar to what is found in a PRP. Unlike a PRP, they lack other components (monocytes etc.) that can be essential in generating repair. Furthermore, in the processing of these products many of the growth factors may be damaged and not have a great efficiency. Those of us in the know will favor a PRP over these products any day. In general, I think it is safe to say that the more experienced a physician is in this field the less likely he is inclined to depend only on these amniotic growth factor products as a treatment. I should like to mention that one company out there seems to be doing things the right way. They are involved in some FDA trials. This company is Mimedix.